Ghunaimat says King's "three Noes are clear"
AMMONNEWS - Minister of State for Media Affairs and the government spokesperson, Jumana Ghunaimat, on Thursday, stressed that His Majesty's three Noes on alternative homeland, resettlement and Jerusalem are clear and Jordan's only position in this regard. 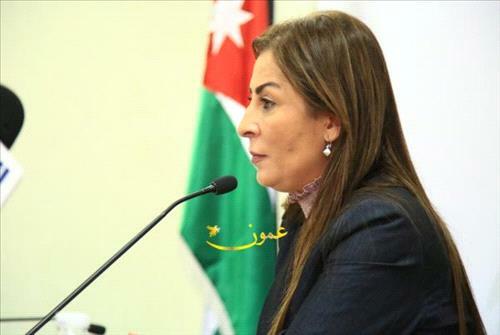 Ghunaimat made her remarks as she met with morning shows hosts at the Prime Ministry, adding that any negotiations that do not consistent with Jordan's constants are rejected. Jordan's position towards the Palestinian cause, the minister said, is clear and aims at establishing an independent Palestinian state on the lines of June 4, 1967, with East Jerusalem as its capital in accordance with UN Security Council resolutions and international legitimacy. Jordanian economy gave several positive indicators, the minister stressed, adding that such indicators came despite domestic and external challenges that facing the Kingdom. Job opportunities for Jordanian youth and media education for students at different stages of study were figured high during the meeting.